It was a rainy day at the Orange Bowl in Miami on January 23, 1983 as the Dolphins hosted the New York Jets in the AFC Championship game. Due to the strike-shortened nine-game 1982 regular season, the divisions had been dispensed with and the playoffs restructured into eight-team tournaments in each conference. Miami, with a 7-2 record, was the second-seeded team in the AFC, while the 6-3 Jets were at number six. 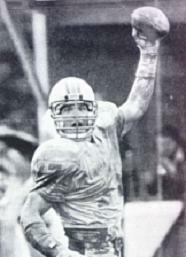 Head Coach Don Shula’s Dolphins were a young club with players averaging four years of pro experience. The defense had been the key to Miami’s success, featuring the “Killer Bees” of Pro Bowl NT Bob Baumhower, ends Doug Betters and Kim Bokamper, and LB Bob Brudzinski, along with brothers Glenn and Lyle Blackwood as the safeties. There was also A.J. Duhe, a former defensive end who had moved to linebacker. The conservative offense featured FB Andra Franklin (701 yards) and wide receivers Jimmy Cefalo and Duriel Harris. QB David Woodley was mobile but nothing special and was occasionally spelled by veteran backup Don Strock. The Dolphins beat the Jets in two meetings during the regular season, including a closely-fought game in December, and handily defeated the Patriots and Chargers at home in the playoffs (the latter game a payback for the wild overtime loss of the year before). New York, coached by Walt Michaels, was coming off of playoff wins at Cincinnati and against the Raiders in Los Angeles that had highlighted their strengths. RB Freeman McNeil led the league with 786 yards rushing and added 303 more in the two postseason contests. Pro Bowl WR Wesley Walker caught 15 passes for 314 yards and two TDs against the Bengals and Raiders. While the defensive line that had earned the nickname “New York Sack Exchange” the year before was not as dominating due to the loss to injury of DE Joe Klecko, the other three members (DE Mark Gastineau and tackles Marty Lyons and Abdul Salaam) did well. QB Richard Todd ranked third in the AFC in passing and rallied the Jets from behind in both playoff games. There were 67,396 fans in attendance at the rain-soaked Orange Bowl, and they sat through a scoreless first half. While NFL rules required that a tarpaulin be placed over the field during inclement weather prior to a game, the field had been left exposed as heavy rain pelted it in the 24-hour period prior to kickoff, leaving a muddy swamp throughout with the deluge continuing during the contest. The Jets went from their 34 yard line to midfield on their first possession, but Todd threw to a double-covered WR Johnny “Lam” Jones and Glenn Blackwood intercepted the pass. However, Miami turned the ball back over on its first play when Woodley threw a long pass intended for Cefalo that SS Ken Schroy picked off for the Jets. Early in the second quarter, Woodley (pictured at left) evaded Gastineau’s grasp and ran 17 yards to his own 39 yard line. But RB Tony Nathan fumbled the wet ball on the next play and CB Bobby Jackson recovered at the Miami 41. New York’s offense couldn’t take advantage and had to punt. Such was the case until near the end of the half, when Miami’s Tom Orosz booted a punt 45 yards from deep in his own territory to give the Jets possession near midfield. Bokamper sacked Todd twice, on second and third downs, and CB Don McNeal blocked Chuck Ramsey’s punt. With the ball at the New York 20, it appeared that the Dolphins might break the impasse before halftime, but Schroy again intercepted Woodley and the Jets ran out the clock. In the third quarter, a Todd pass intended for Jones was intercepted by Lyle Blackwood, but a defensive holding penalty nullified the play. However, Todd went to the air again to RB Mike Augustyniak, and the ball hit his hands and was picked off by Duhe. On a second-and-two play at the New York 40, Franklin lost the ball and Gastineau leaped on it, but the officials ruled that the running back was already down and Miami maintained possession. Another key play came on a third-and-three situation at the Jets’ 27 as Woodley completed a pass to Harris for 13 yards. FS Derrol Ray’s vehement protest earned an unsportsmanlike conduct penalty that moved the ball to the seven yard line. From there, RB Woody Bennett ran through the middle of the line for a touchdown. Midway through the period, Duhe intercepted another pass that gave the Dolphins possession at the New York 41, but this time they were unable to capitalize. Two minutes into the fourth quarter, Todd, intending a screen pass for RB Bruce Harper, was picked off for a third time by Duhe, and this time the linebacker returned it 35 yards for a touchdown (pictured at top). The two-touchdown lead proved to be more than enough as the Jets never threatened in the remaining time, and the final score was 14-0. Neither team accumulated much yardage, with the Dolphins outgaining the Jets by 198 yards to 139 and holding the edge in first downs at 13 to 10. Both teams sacked the other’s quarterback four times apiece, and while the Jets had the most net passing yards (77 to 60) they gained only 62 on the ground, to 138 yards for Miami. There were nine turnovers in all, five suffered by New York (all interceptions) and four by the Dolphins (one fumble and three interceptions). Freeman McNeil was shut down, gaining just 46 yards on 17 carries. Wesley Walker caught one inconsequential pass, for no gain. Richard Todd completed only 15 of 37 passes for 103 yards and was intercepted five times. Bruce Harper caught four passes out of the backfield for 14 yards, while Johnny “Lam” Jones gained a team-leading 35 yards on three receptions. 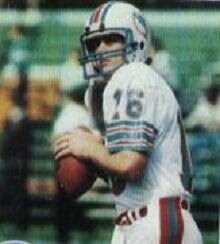 In winning, David Woodley was successful on 9 of 21 passes for 87 yards with no TDs and three interceptions, and also led the Dolphins in rushing with 46 yards on 8 carries. Andra Franklin was right behind with 44 yards on his 13 runs before suffering a head injury and Woody Bennett carried 13 times for 24 yards and the only offensive touchdown of the game. RB Tommy Vigorito was the leading receiver with three catches for 29 yards. Indeed, Duhe was the player of the game for Miami, with the three interceptions while lining up in six different positions during the course of the contest. Kim Bokamper (pictured at right) recorded three sacks, Glenn Blackwood and Gerald Small each picked off a pass, and Don McNeal had the blocked punt. Miami went on to lose the Super Bowl to the Washington Redskins. As for the Jets, Coach Michaels quit the team in the offseason and was replaced by assistant coach Joe Walton, and the team suffered through two losing years before returning to the playoffs following the 1985 season; they would not advance as far as the AFC Championship game again until 1998.